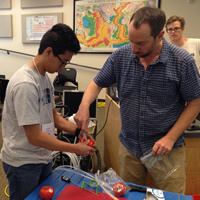 iUTAH’s Summer Research Institute (SRI) engaged students at many levels in experiential methods, or learning by doing, offering students and teachers the chance to become scientists for one week each summer. SRI was designed to help teachers and prospective teachers understand what scientists do and how they collaborate on research. Director Louisa Stark and Senior Education Specialist Molly Malone from the Genetic Science Learning Center at the University of Utah organized and led the program using their expertise in developing online interactive curriculum materials for use by educators and their students. Over the four years, 2013 – 2016, that SRI was offered, the program reached 96 high school students and teachers, and undergraduates in 13 diverse research projects reflecting iUTAH's cross-disciplinary approach. Over half of the participants were female, and 70% of the student mentors were from schools like Utah Valley, Weber, and Dixie State Universities whose focus is on educating undergraduates. The impact of the SRI program was two-fold. Students and teachers from across the state were able to engage in iUTAH’s water research projects at a single campus for one week each year. Faculty, post-doctoral, and graduate student mentors learned how to prepare curricula through individual and group interactions. The program succeeded in widening the STEM pipeline in Utah, bringing students and teachers from different geographic, age, and underserved backgrounds together to learn. The program, as a whole, supported peer mentoring in many different directions. High school students learned from undergraduates, undergraduates learned from graduate students, and teachers and university faculty learned from each other. This entire cross-pollination process produced curricula that have been widely shared, both nationally and internationally. The Model Earth curriculum is an open access online resource with over 18,823 visitors and 35,931 page views in 2016. 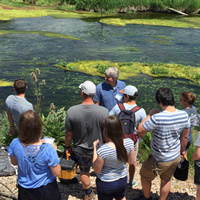 Within this curriculum, the most popular module is Manage a Watershed, which combines lessons from both the CI-Water and iUTAH projects. The Model Earth curriculum and Classroom Activities are available online through the learn.genetics website at the Genetic Science Learning Center, University of Utah, a partner in the iUTAH project, for use by educators and their students.